Razer has a pair of new keyboards out today, the Huntsman and the Huntsman Elite, which offer a new spin on mechanical keyboards: they’re Razer’s first models to feature opto-mechanical key switches, which combine the tactile clicking of a mechanical keyboard with optical, IR-based technology that detects when the key is pressed for far faster actuation. It’s a clever solution that allows Razer to offer even better responsiveness for gamers who need it, while still keeping the tactile, mechanical feel that’s so important to enthusiast users. Razer says that the keys themselves should offer a similar feel to the existing Razer Green switches used in its other keyboards, but with 30 percent faster actuation than traditional mechanical switches due to the optical sensors. 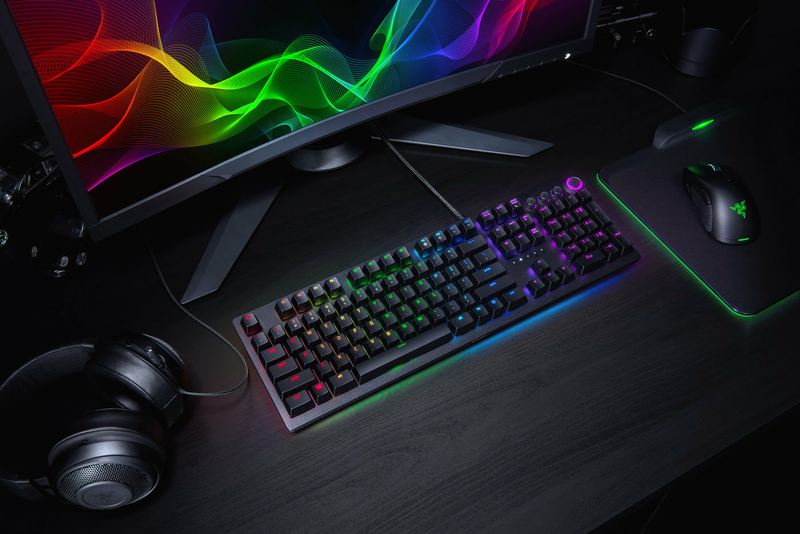 The new tech also means fewer moving parts, which Razer says should translate to less mechanical issues and a longer lifespan (the Huntsman keyboards are rated for 100 million keystrokes). The base model Huntsman offers the opto-mechanical switches and the standard Chroma lighting for $149.99, but there’s also the Huntsman Elite model, which adds a few extra features for an extra $199.99. In addition to the key lighting, the Elite also offers underglow lighting for illuminating the bottom of your desk around the keyboard — and in a clever touch, Razer is including a magnetic palm rest that also offers underglow lighting through a hidden POGO pin connector, so you won’t have to choose between looking cool and feeling comfortable. The Elite also offers multimedia controls (both buttons and a scrolling dial) at the top right of the keyboard, which are fully customizable for whatever users want. Both keyboards are available today on Razer’s website.